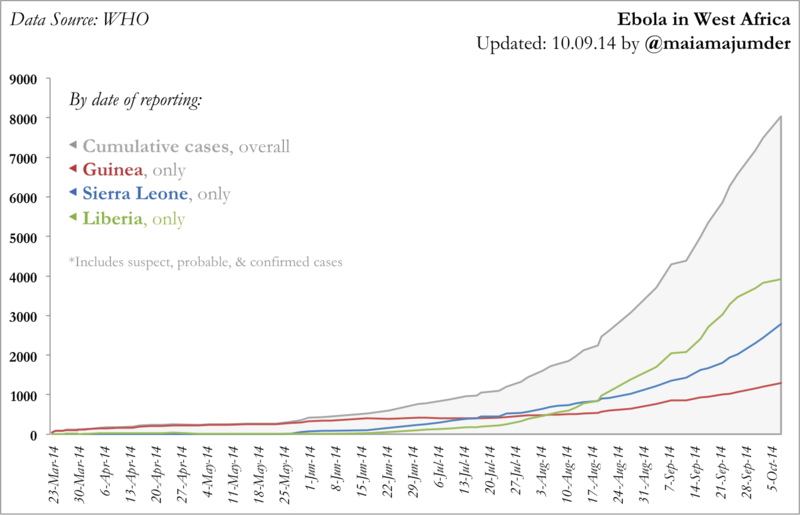 After a brief hiatus, here’s another roundup of Ebola science I’ve seen over the past 14 days. I think fortnightly reports may be the way forward from here on out. A couple of weeks ago I wrote that it seemed like most contacts that were identified were getting traced. Last time around we started to get into what proportion of cases were actually being identified at all. Caitlin Rivers dug into the county level data in Sierra Leone and Liberia, to show which regions have low case confirmation rates – often despite the WHO reporting that they have adequate lab capacity (Caitlin also has a great post highlighting the importance and difficulty of contact tracing to find these suspected cases). Ian Mackay proposes that the gap between cumulative case report #s and death/lab confirmations represents a loss of control – a “control gap”. I’m not quite as pessimistic as I read Ian to be: the graph he shows seems to also be congruent with rising case numbers and a fixed lag between suspected and confirmed case reports. But both the level of, and rate of change in, data quality remains unclear to me. The reporting front. As Maia Majumder shows in a recent blog post, the rate of increase in reported cases in Liberia appears to be falling. As she notes, however, it is unclear if this is a function of changes in Rt or the limitations of surveillance and/or healthcare systems. The WHO reports ongoing deterioration in Monrovia, worsening data collection and the continued spread of infection to the far east of the country. In Guinea, cases remain steady, which is raising concern. The epidemic is focused around Conakry and in the far south-east by the SL and Liberia borders, where the epidemic began early this year. The modelling front. As I posted a table last week, others (the European Centre for Disease Prevention and Control, to be precise) were moving rapidly to produce a wonderful figure showing weekly case reports to date, and the projected figures going forwards.2 Notably, as I suggested last time out, while the predicted numbers in the absence of intervention vary greatly in absolute terms, they all point in roughly the same direction on a log scale. Over the past couple of weeks, Sierra Leone’s oddly low case fatality rate (CFR) has come under scrutiny. It appears that the previous Minister of Health had a policy that only confirmed cases who died within healthcare facilities counted as Ebola-related deaths. Those who didn’t make it to a hospital did not count (~50% of the first 2000 confirmed cases).3 The upshot: the method has now been changed, and the old data will be updated at some point in the future. But the cumulative CFR in SL remains far below that of Guinea and Liberia. So far there has been only a small up-tick in SL CFR based on WHO numbers – see 2nd figure on this blog post – but the latest numbers from the MoH in Sierra Leone are considerably higher, so expected change in the near future.). A new entrant: the ECDC make really nice maps that merge the current and the historic totals in a simple but effective manner. Well worth checking out. See also last week’s post and its section on maps. The figures produced in the WHO’s bi-weekly sitreps – particularly their Wednesday ones (e.g. this week and last week [pdfs]) – are also well worth looking through. I’ll also give a shout-out to Shane Granger‘s latest work from the Liberian government figures, which clearly shows the variation in cases and deaths across the country. Social and Behavioral Change Communication. There is much theory on communication for change, some existing materials (e.g. the Health Compass) and active communities discussing and implementing programs (e.g. Springboard). I’m not convinced that theory is being used to build many of the on-the-ground programs, which is a shame, but something roughly right now may well be more important than something perfect in a month’s – or even a week’s – time. Paint me ambivalent, but also short of time to dive deeply into this field. Quarantine. Since late September Sierra Leone has restricted movement for about one-third of its population to within their home county. In contrast to the 3-day lock-down of the whole country, the aim here is to keep potentially infected (but not yet infectious) people from spreading the disease by moving elsewhere and then becoming infectious. It is unclear how much additional benefit that will bring over and above existing social distancing measures (e.g. no physical contact), but as with many interventions, the goal here may be reassurance rather than direct risk reduction. “Community care”. In the absence of sufficient hospital space, there is a move to provide “home-care kits” to reduce the risk of within-home transmission. While no-one thinks this is a perfect solution, it might provide stop-gap benefits. And as Mead Over at the Center for Global Development argued with his usual great cogency, imperfect interventions that get Rt below 1 may be good enough – even if they aren’t ideal. C3. Social epidemiology(!). 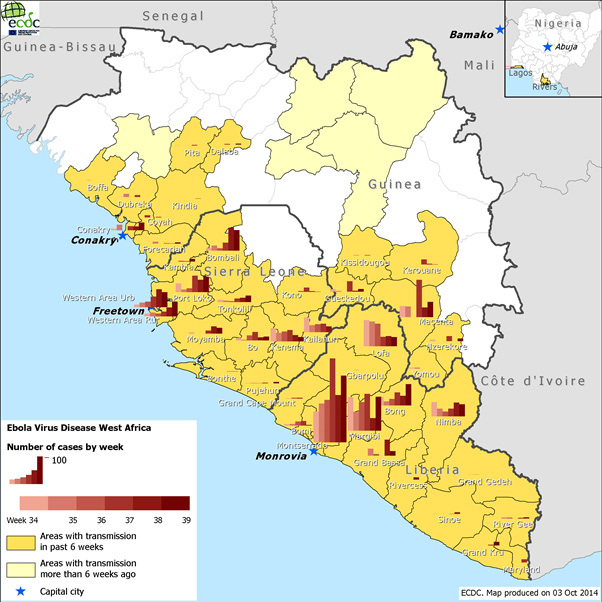 I was thrilled to see Daniel Hoffman had put together an ecological analysis of county-level Ebola growth rates and poverty in Sierra Leone (finding: a positive association). As Hoffman (and Caitlin Rivers) note, this is nothing causal, but we might not be surprised to see poorer districts doing worse at controlling an epidemic – especially if poverty is higher in rural areas far from the resource-rich capital. In any case, it’s great to see people thinking about social determinants of health within countries, as well as Paul Farmer and others at Partners in Health highlighting how poverty made the most-affected countries vulnerable to Ebola in the first place. One resurgent debate – in light of the recent imported case to Dallas, TX – has been over shutting down air-travel to/from SL, Guinea and Liberia. Views on both sides seem very strong, and not particularly evidence-based.The argument about restricting the arrival of Ebola support I think we can leave to one side – if restrictions were created, exemptions could be made for vetted, relevant resources (including human resources). The main remaining pro-restriction argument appears to be that, unlike border closures, ending air-travel would probably reduce risk in Europe/US/not West Africa. And linked to this, screening at point-of-travel isn’t very useful for catching Ebola cases. These points seem valid, but not particularly important, since secondary and particularly tertiary infections from imported cases look very unlikely in settings with robust public health systems. On the down-side, restrictions would have potentially significant effects on trade for the West African region (not just the core 3 countries, where economic activity is already hugely affected), in addition to the likely increased stigmatization of nationals of many West (who are we kidding, any and all) African countries, even if they haven’t been in (West) Africa in the past month/year. But how does this trade-off against people reacting worldwide in (quite possibly unreasonable) fear of Ebola, and thus restricting their economic activity. Am I missing a key point here that swings the argument? A WaPo article by Gerardo Chowell-Puente highlighting that the basic reproductive number of Ebola is under 2, and that the serial interval is long, and that this gives us a good chance of beating it down. And a long, less sciency WaPo piece laying out the epidemic’s timeline in great detail, with plenty of input from Tom Frieden. A Slate podcast covering many of the topics covered here each week – but probably a little more digestably (disclosure: I haven’t listened to this one, but I do listen to other Slate podcasts all the time, and like them). A piece on Science by Kai Kupferschmidt on how scientists should be talking to everyone else about Ebola (I don’t agree with all his points, and the tone is a little too forceful for my liking (maybe that’s the point?) but it’s nice to see someone thinking carefully about communication). As ever, comments very welcome, either here or @harlingg. 1 For more regular and more comprehensive updates than I can produce, I continue to strongly recommend Ian Mackay‘s blog Virology Down Under and ‘s personal blog Mens et Manus for great up-to-date temporal coverage of the epidemic. You might well also like to read Caitlin Rivers‘ series of posts on her blog that focus on less-considered aspects of the epidemic, often from a quantitative standpoint. 2 This figure also pointed me towards the broader work of the ECDC, which includes providing downloadable data and very regular updates (e.g. this week’s ECDC Ebola update). ECDC are also the publishers of Eurosurveillance, one of the key journals for rapid publication on Ebola. 3 As a side-note, this proportion may be a useful input to models attempting to understand how short of capacity healthcare systems currently are. 4 A review of the Nigeria outbreak by Folorunso Fasina and colleagues earlier this year highlights the role of contact tracing, isolation and quarantine in stopping the chain of infections. I’m not sure how applicable this approach is to the current situation in Guinea/SL/Liberia, but it does highlight the importance of early, forceful action.